A full length group portrait of two girls (wearing European floral dresses) and a boy, probably sisters and brother, posing beside a river or lagoon. Morton, Chris. 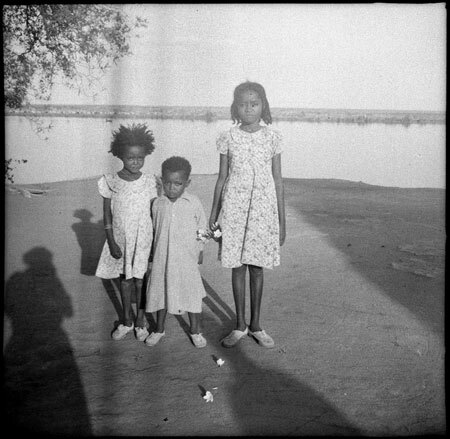 "Portrait of children in Mandari" Southern Sudan Project (in development). 03 Jan. 2006. Pitt Rivers Museum. <http://southernsudan.prm.ox.ac.uk/details/1998.97.204/>.